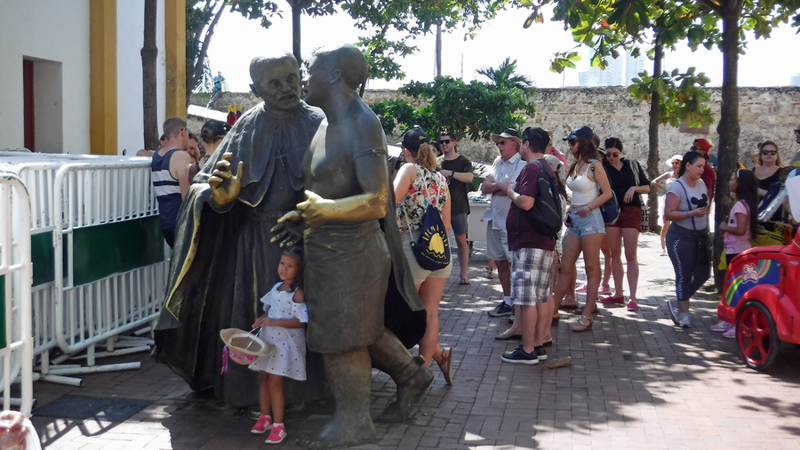 A free walking tour is the best way to experience the Walled City. We noticed the tour guides with yellow umbrellas and their groups of about twenty people and wondered if they offered English speaking tours. Luckily they did offer tours in English and we reserved a spot online. 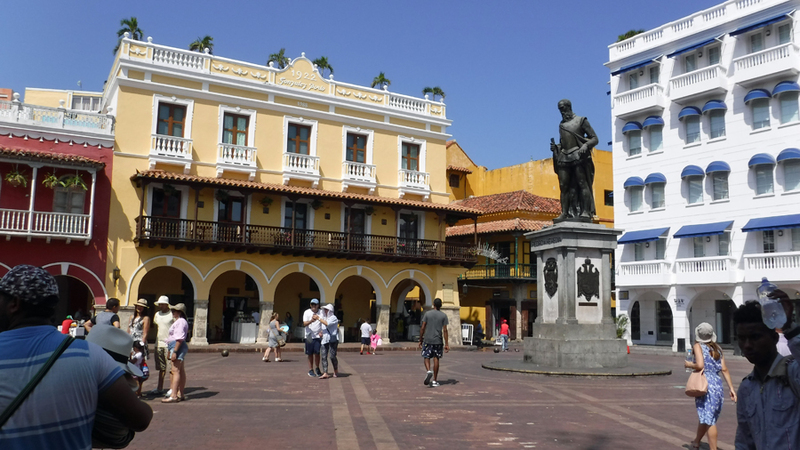 I am repeating myself when I say nothing in Colombia is free. This includes the free walking tour. While there are no fees for the tour, tips are expected at the end. 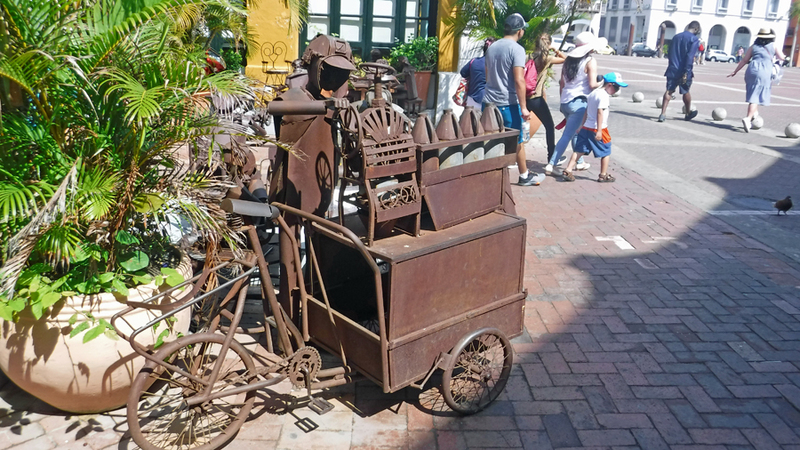 The tour guide make this very clear at the beginning and will tell the tourist he is trying to earn a nice size tip by providing the best walking tour ever. He did provide a fabulous 2 hour tour that included history, humor and fun facts. 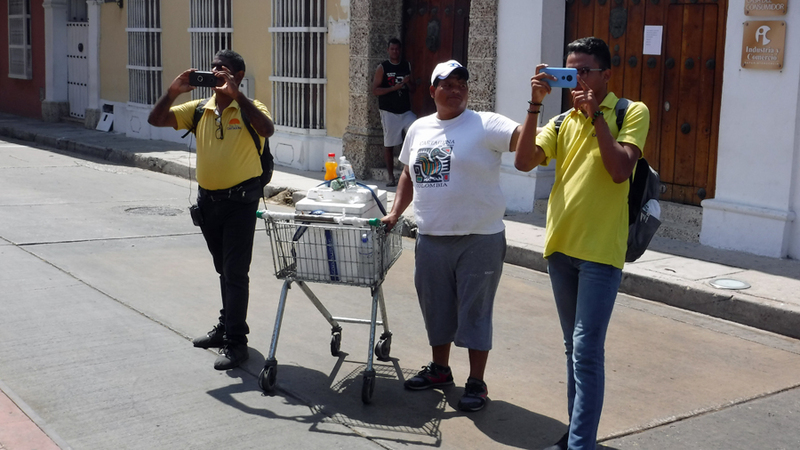 We paid him, for both of us, 70,000 pesos (US$22 or 20€) for his efforts; by Colombian standards a very nice tip. Pointing out a building once occupied by the Spanish Inquisition really makes a person realize the length of history and wonder how many people have walked down the same narrow cobbled streets. One of the great things about these tours is when they point out things we have already walked past a couple of times without realizing we were missing something. 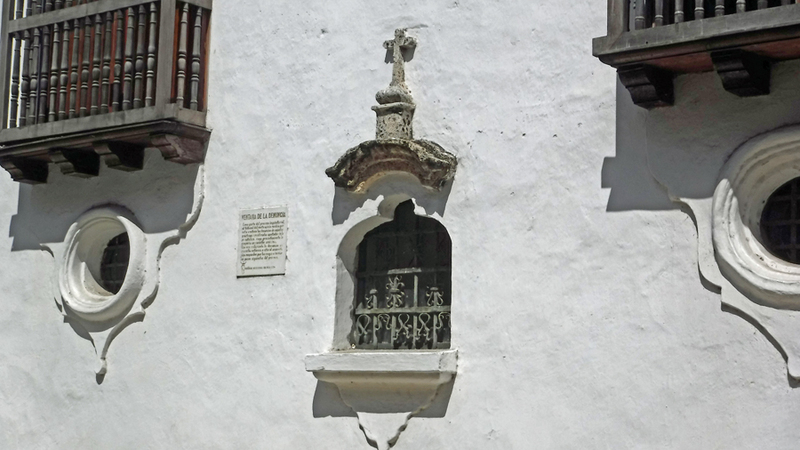 On the side of the Spanish Inquisition building is a small window. It was through this window where members of the community would anonymously drop a letter accusing a neighbor of heresy. If three letters were received, the person was arrested and presumed guilty until proven innocent. The chances of an innocent verdict were slim to none. The accused heretics were tortured mercilessly. If they confessed to stop the horrid torture, they we killed because they admitted guilt. If they didn’t confess, they died from the torture. As our guide said, all of this was done in the name of God. The Spanish Inquisition was formed in 1478. 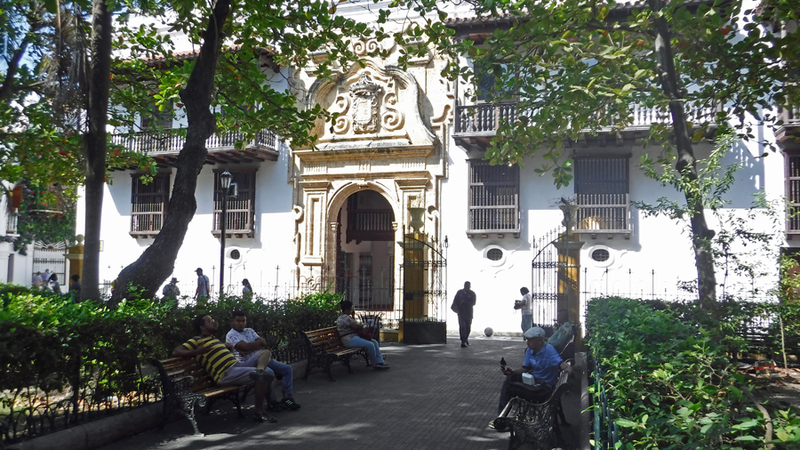 Some 300 years later, this building was built for the Colombian sect and in 1770 the building was completed. I cannot imagine the horrors that transpired inside the walls. I consider myself a person with a pretty strong stomach for gore and this sort of stuff, but this building still gives me the heebee jeebees . The Inquisition was eventually disbanded after 356 years, in 1834. It only took another 166 years for the Pope to ask for God’s forgiveness. The museum once displayed torture equipment used on victims during the inquisition. These items have been removed from display in 2015 prior to visits to Colombia by Pope Francis. It is now an art museum. We all look back on those olden days as being barbaric. However, when you think about it, it wasn’t that long ago. It was just about 200 years ago since the Spanish Inquisition was disbanded by the Catholic Church. I tend to ponder the question, in the year 2220 will the people in the future look back at our generation as barbaric? 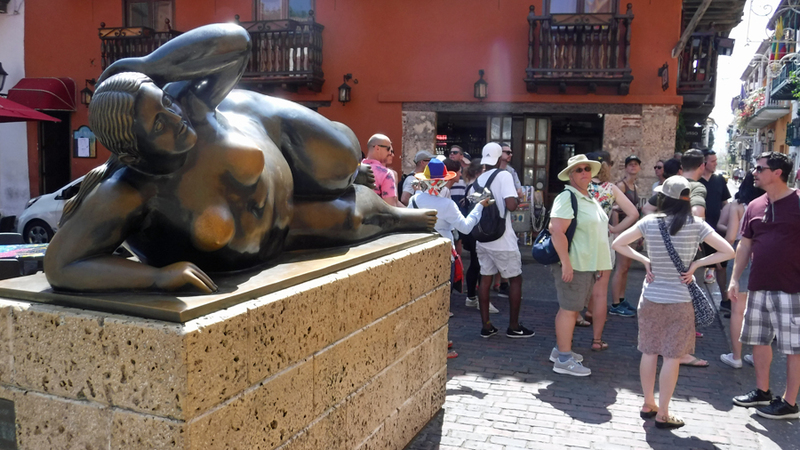 The big naked lady statue makes me laugh whenever I see it. 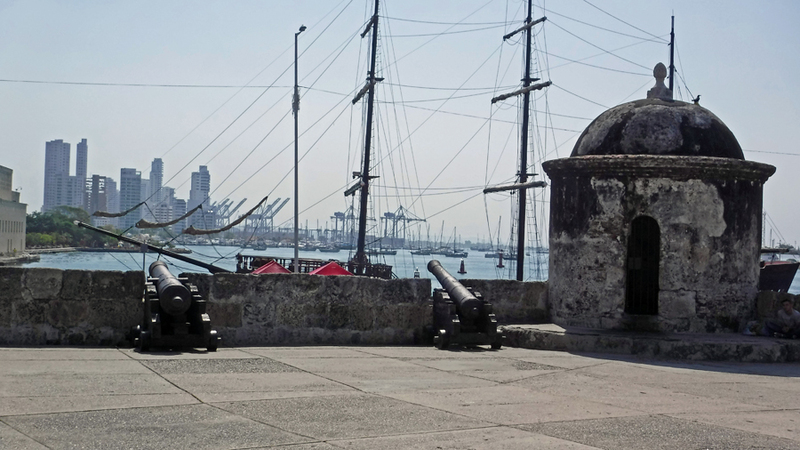 A Cartagena myth says, if you wish to return to the Wall City you must have your picture taken with both your hands on her breast. Judging by the fact the bronze was worn on her breast, I think a lot of people are hoping to come back again. Speaking of knockers, I also learned about door knockers. During the colonial times, a door knocker represented the occupants of the house and their status in the community. 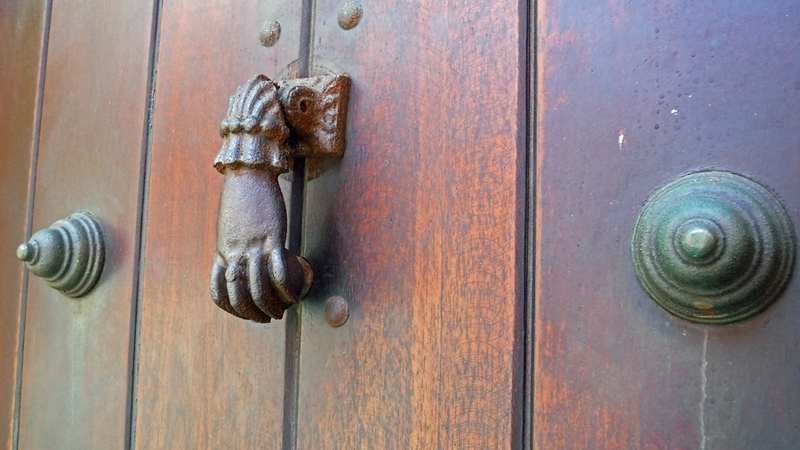 A hand door knocker represents Catholic. A lion represents a merchant. Any type of sea knocker such as a fish represents a fisherman. On our house in Atlanta, we used to have a brass knocker with a basket. We put a notepad and pencil inside the basket just in case someone wanted to leave us a note. In the 20 plus years we lived there, not one note was left for us. Or at least I don’t think one was since I don’t recall either of us ever checking. 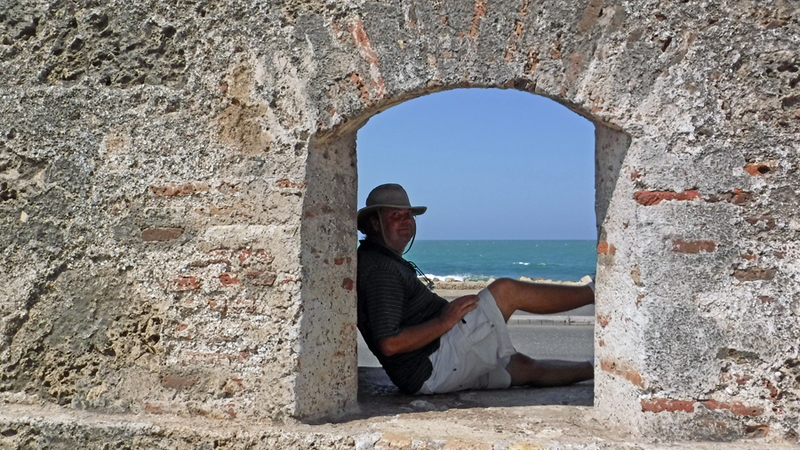 I had to chuckle when our guide took us inside one of the churches, Iglesia de San Pedro Claver. 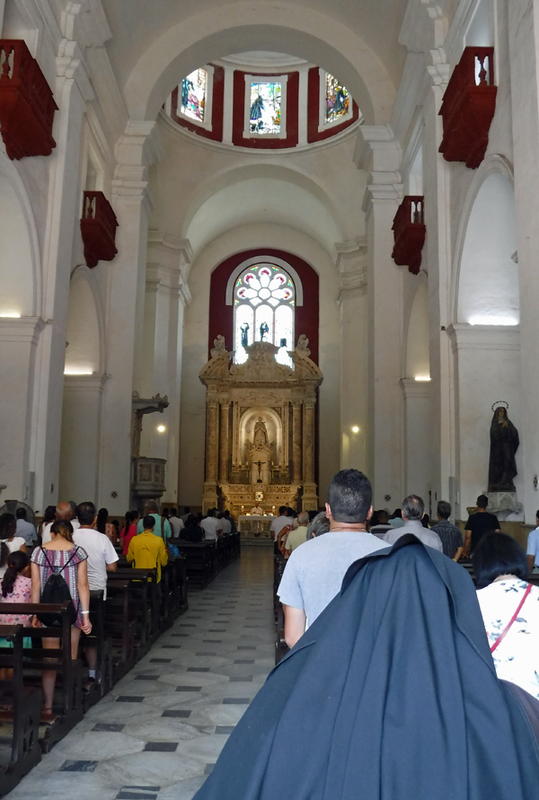 There happened to be a mass going on at the time so he told us about the church on the doorsteps and asked us not to take flash pictures. He said, this was one of the newer churches in the area as it was built between 1580 and 1654. 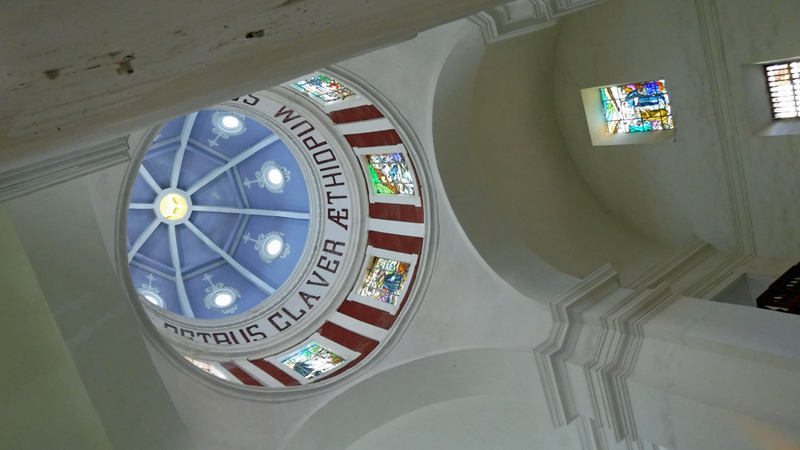 Under the alter of the church lies the bones of Saint Peter Claver, who died in 1654 in Cartagena, after devoting practically all his life to evangelizing and redeeming the black slaves of New Granada. His bones are displayed behind a glass window in the low part of the alter. Yes, you read that correctly. The poor guy dedicates his entire life to helping others and when he dies the church decides to show off his remains. You are even allowed to go up on the alter to take a picture of the bones. I didn’t. Can you imagine getting married in the church and saying your vows while staring at the skeletal remains of good ol’ Saint Peter Claver? Imagine if he turned his head and looked at you. The Nun you see in the picture quickly got up as we exited the church. She deliberately positioned herself between us and the door holding out a basket soliciting donations. 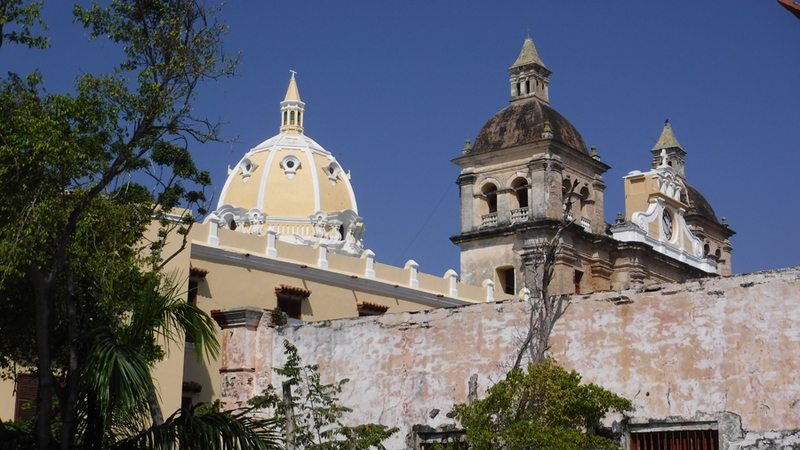 A feature of the tiled rooftops are pointed tiles located in the corners. 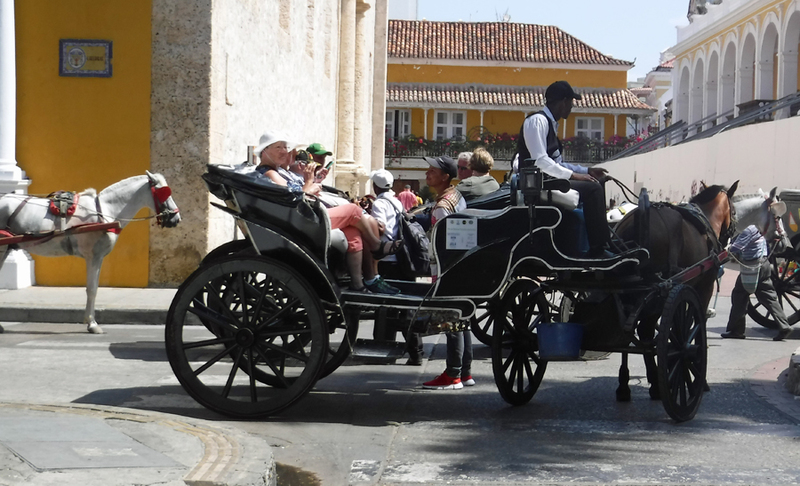 Once our guide pointed this out we noticed them throughout the Walled City. 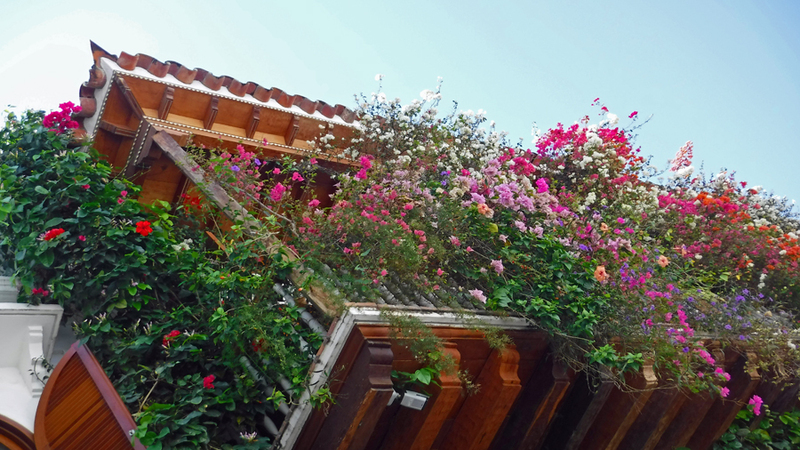 They were most notable on the balcony roofs. This design had something to do with witches. The thought being that witches needed to run in order to be able to fly; a tid-bit that was news to me. The idea behind the sharp corner was to snag the witches robe and trap her. She would then hang from the corner of the roof for all to see the evil being. No doubt the Spanish Inquisition would be alerted. There isn’t any proof the sharp corners worked and we didn’t happen to spot any witches dangling from the rooftops during our tour. 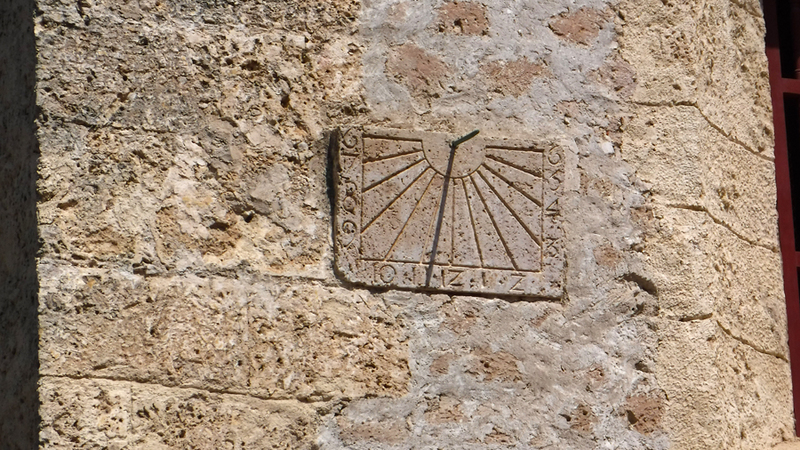 A sun dial on the wall of Catedral de Santa Catalina de Alejandría – taken at 11:15 – More accurate than a Rolex? No winding required. 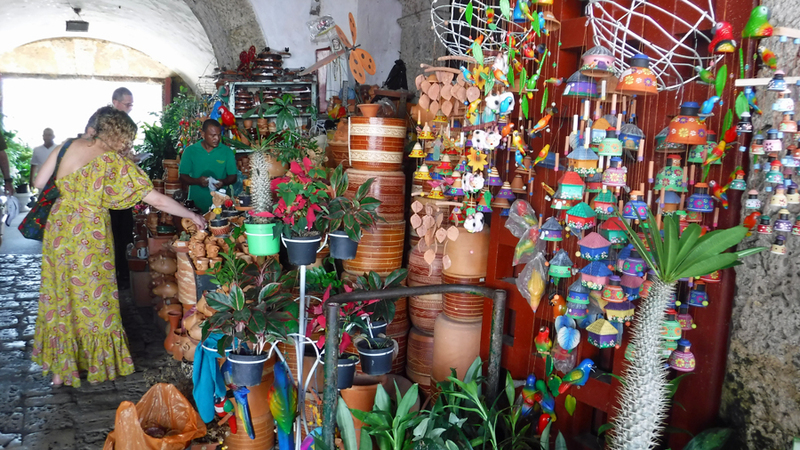 Cindy bought some handmade wind chimes as a souvenir – guaranteed to keep witches away!